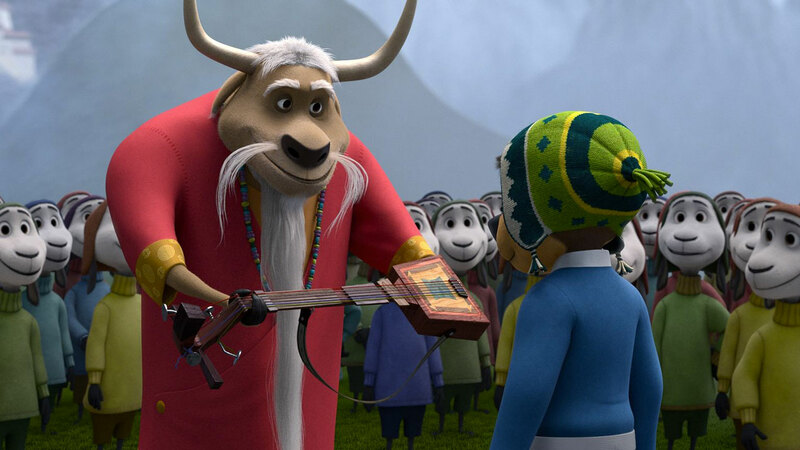 I’m not sure why every animation studio is producing a movie about a young guy with a magical guitar who has to save his village, but I dig it. 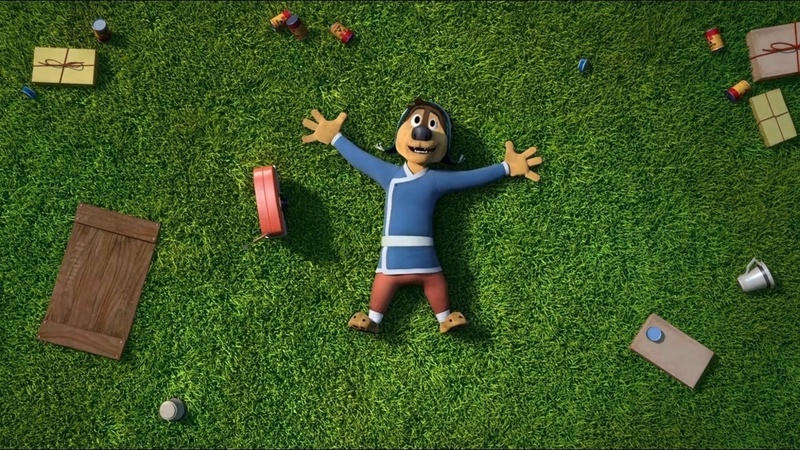 The Book of Life, Kubo and the Two Strings, soon to be Coco, and of course Rock Dog; it’s similar to how two film companies both produce an asteroid-hitting-the-Earth story at the exact same time and pretend not to notice each other. I guess these things come in waves, trends happen, and there are many ideas out there that must be much worse than a cool kid with an axe, so maybe we should count our blessings. Anyway, here’s another in the current stream, a unique production if not an original concept, and a film that’s actually, surprisingly, pleasantly good. On Snow Mountain, the sheep fear the wolves and the wolves fear the mastiffs. Khampa, the big dog in town, protects the woolly citizens of the village with his magic fire powers, sending the wolves running when they come to make a meal out of the the sheep. But he knows that they’ll be back, and so begins to plan. He bans music from the town, since the sheep paid no attention to anything else. He trains an army dressed up in dog costumes in order to trick the ever-watching wolves. And he commits to making his only son, Bodi, the most vigilant watchdog ever to walk the mountain. The only problem is, Bodi can’t harness the fire, doesn’t think the wolves are coming back, and just wants to follow his own dreams. One day, when a passing plane loses some of its cargo, a radio falls near Bodi and he begins to listen to Angus Scattergood, the rock legend from the big city. Bodi falls in love with rock, with the guitar, with expressing yourself through music, and he knows that this is what he was meant to do. So, with his father’s temporary blessing, Bodi travels to the city in search of a band to join and a career to make. Meanwhile, the wolves plan to kidnap the doggie unawares, making a ransom of him to the great Khampa, getting the sheep in return. Bodi is oblivious, and just wants to meet the famous Mr. Scattergood, who is having troubles of his own, mainly coming up with more hit tunes, something that Bodi might just have a gift for. 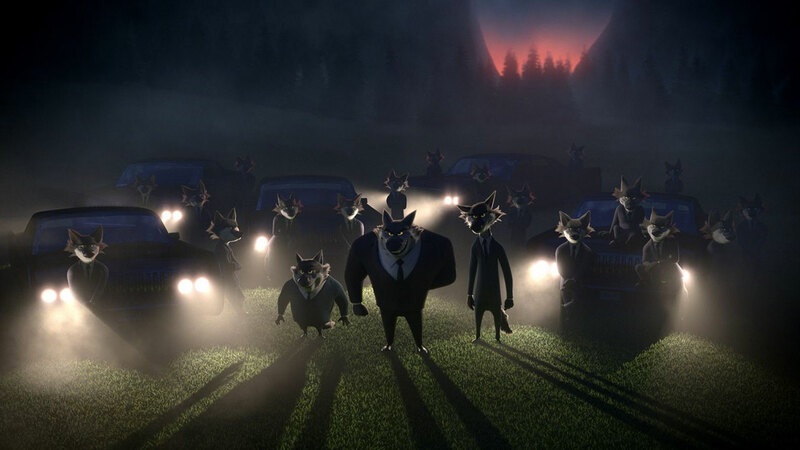 It’s a predictable plot, and like I said, it’s been done a handful of times in recent years, so you’ll know exactly what you’re getting from Rock Dog if you’ve seen any of the other films that basically follow the same path. What’s different here is that the film was made to be released in China and the United States in staggered order, Chine first, then the U.S. Signs in the movie are in Chines and in English, the setting is Tibet or a modern city, and you can imagine how easy it would have been to dub the film in either language. In the States, a surprising number of stars and b-listers signed on; I doubt there was much of a time commitment involved. Wilson, Izzard, Elliott, J.K. Simmons, Lewis Black, Kenan Thompson, Mae Whitman, Jorge Garcia, Matt Dillon; not the worst compilation of recognizable voices for an animated kid’s flick. And, you know, the visuals were pretty cool, the animation not Pixar level but much better than some of the cheap knock-offs you see thrown around by the smaller studios. This movie was done by Reel FX, which did Free Birds and The Book of Life, so it’s legit, if not high level. When I looked up images to add to this review, there were a plethora of attractive ones to choose from, reminding me that the artistic quality of the film was actually really strong, something I didn’t appreciate until I stepped away, probably because I’ve grown used to top-notch animation and am less impressed by it now than I used to be. The story itself was pretty funny, fairly clever, and as straight forward as you could ask for; basic entertainment perhaps, but in a good way. 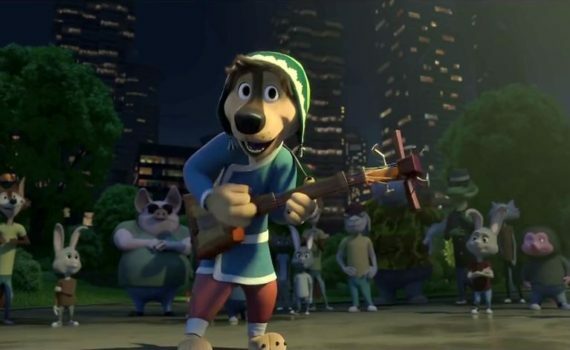 My kids came away loving it, my son claiming it as his favorite movie, so take that for what it’s worth, and add in my opinion that Rock Dog is actually worth your time. Video – With an aspect ratio of 1.78:1 (16×9, 1080p HD), this Blu-ray disc is surprisingly sharp and the animation is shockingly good. I didn’t expect much coming in from an off-brand animation company and a movie that wasn’t marketed to be a big hit, but I was pleasantly impressed. The animation is great, the color is superb, and the Blu-ray quality is as good as you can expect from other, more expensive films. Audio – The Blu-ray was done in English 5.1 DTS-HD Master Audio, with an option of Spanish 5.1 Dolby Digital. Subtitles are available in Spanish and English SDH. The audio quality, like the video quality, is better than you might imagine. The music of the film is catchy and fun; not quite Disney soundtrack caliber, but not too far off and absolutely good enough to enjoy. Extras – There are actually a ton of special features on the Blu-ray, if you’re thirsty for more. Finding the Fire: The Making of Rock Dog – 6 mins, graphic novel adaptation and interviews. Mic Check: Casting the Voices – 6 mins, introducing the American vocal cast. A Rockin’ New World: Animating Rock Dog – 6 mins, the development from drawings to characters. Rock Dog and Roll: Exploring the Music – 6 mins, a sit down with songwriter Adam Friedman. ‘Glorious’ Music Video – 3 minute song with clips from the film. Also from Lionsgate: Middle School, Leap!, Norm of the North, Shaun the Sheep Movie. And lastly, Bookmarks. Recommended. 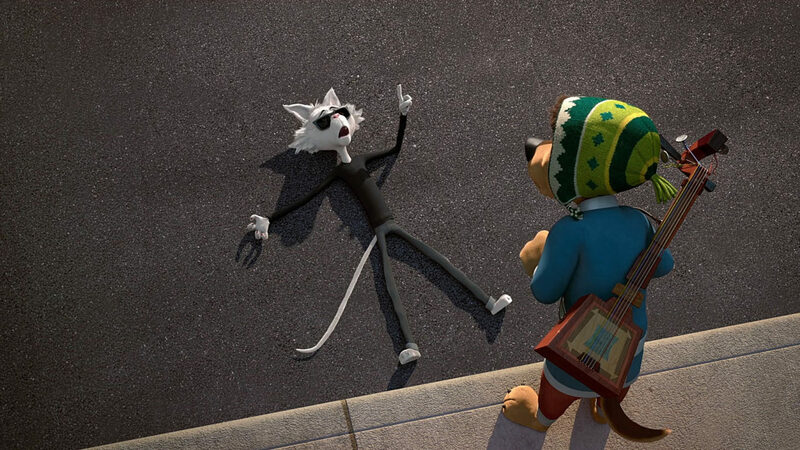 Rock Dog is better than it appears. I sat down to watch it with my kids, not expecting much at all, but I was entertained throughout and impressed by the attention to detail apparent from the very beginning. In a way, it was like a Studio Ghibli film; an emphasis on positive story and cool animation with the knowledge that it is being made for both Asian and American audiences. That opened the movie up a bit, allowed for some nice voice overs, and didn’t constrain it to the standard, Hollywood, goofy, juvenile, animated comedy. Perhaps that’s sacrilege, and this definitely isn’t Ghibli, but I have to give credit to something that was made with much more heart than I had imagined it would be. The video is solid, the audio very nice, and the extras plentiful, so you can enjoy the technical side of this project as well. Get you family together, check out Rock Dog with an open mind, and enjoy.